Irish food firm Virginia Health Foods has launched a new range of what it describes as “savoury snackable seed cubes” under the Squbes brand name. Promoted as “no mess, nutritious, savoury snack, full of flavour and with no refined sugar”, Squbes Seed Cubes are said to be made with 100% natural ingredients and no wheat, to be high in fibre, protein, and magnesium, and to only contain “good fat”. “Ireland’s wild and natural landscape inspires us to create these wonderfully pure and nutritious topping products”, the company website e states. 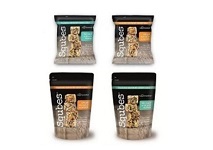 Two varieties of Squbes Seed Cubes are available: Spiced Sesame & Almond, featuring a mixture of sunflower seeds, sesame seeds, linseeds, chia, nigella seeds and almonds; and Sea Salt & Black Pepper, containing a mixture of sunflower seeds, pumpkin seeds, linseed, chia and nigella seeds. Both are offered in 100g re-sealable packs priced at an RRP of £2.50 ($3.11) and 30g sachets at an RRP of £0.90 ($1.12).